Inclusions: Expert guide service for Hadrian’s Villa, private transportation, entrance tickets, taxes, tolls and parking. Note: Audio guide also available for Hadrian’s Villa. This day tour from Rome to the historic hill town of Tivoli features a tour of both Villa Adriana (Hadrian’s Villa) and Villa D’Este Gardens. After a 45-minute drive from Rome, you will reach Villa Adriana (Hadrian’s villa) and begin your Tivoli tour. The vast and extravagant Hadrian’s villa in Tivoli, was built to be the country residence of Roman Emperor Hadrian around 134 A.D. The villa is said to be the most opulent and elegant of the Roman world. It is approximately 7 square miles. The vast complex included libraries, theaters, baths, sculpture gardens, alfresco dining halls, pavilions, private suites and more. The villa, now a UNESCO World Heritage site, is mostly in ruins but a significant portion remains. Before continuing on your Tivoli tour you will enjoy a stop for lunch at a local restaurant. Suggestions for lunch will be provided and reservations will be made as needed. After lunch you will tour Villa D’Este, now a UNESCO World Heritage site. It is known for the beauty of its magnificent gardens and fountains which became an early model for European gardens. This was the Renaissance residence of Cardinal Ippolito d’Este in the mid 1500s; the playful fountains and “water games” here were created from the plans of such famous artists and architects as Bernini and Pirro Ligorio. 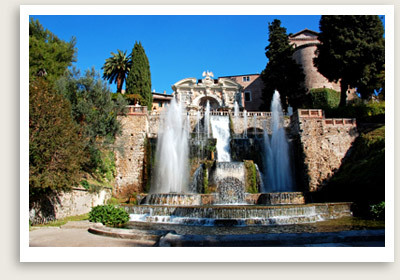 You may have time for a brief stroll at Tivoli’s historical center before returning to Rome.